My sister and grandma came to visit me in Korea during my summer break. We were together from August 8 - 20, 2014. Here are the retellings of Day 1 and Day 2. 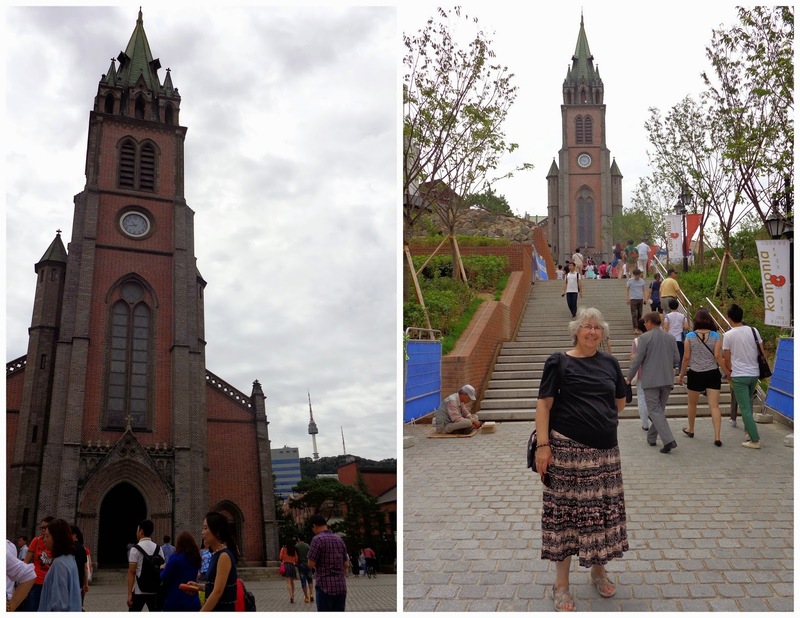 On Sunday morning Jacki and Grandma went to mass at the Myeongdong Cathedral, where Pope Francis would be later in the week for a five-day visit. While they were at mass, walked through the area and helped a lost tourist find the cathedral by walking her there. Then I located a nearby cat cafe for us to visit later, and got some breakfast. 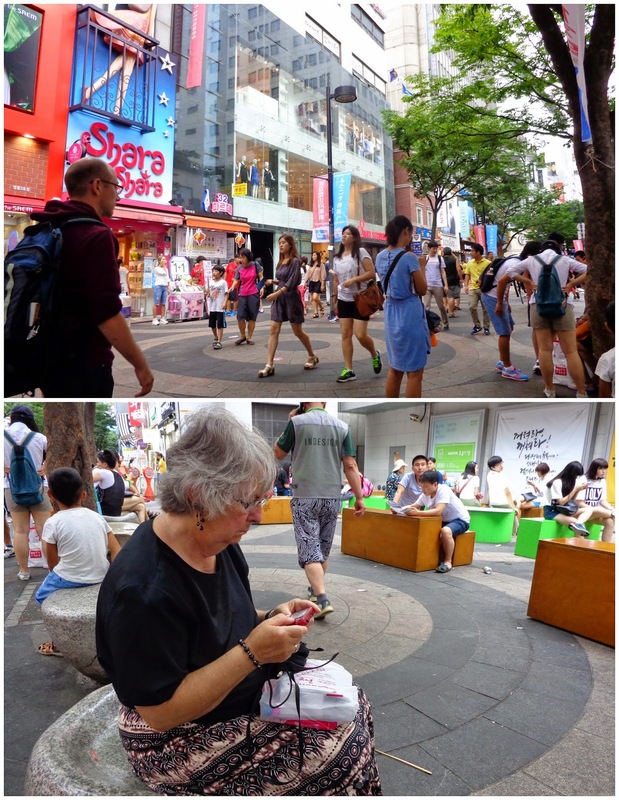 Myeongdong is a huge shopping area, so after church Jacki found two dresses at a nearby shop, and Grandma picked up a few things at a bookstore down the block. Although my grandma was not thrilled about it, as I mentioned cat cafe was indeed on the day's agenda. It didn't open until noon, but my sister correctly predicted that Grandma wouldn't have much of an appetite afterwards, so Jacki suggested we eat lunch first. 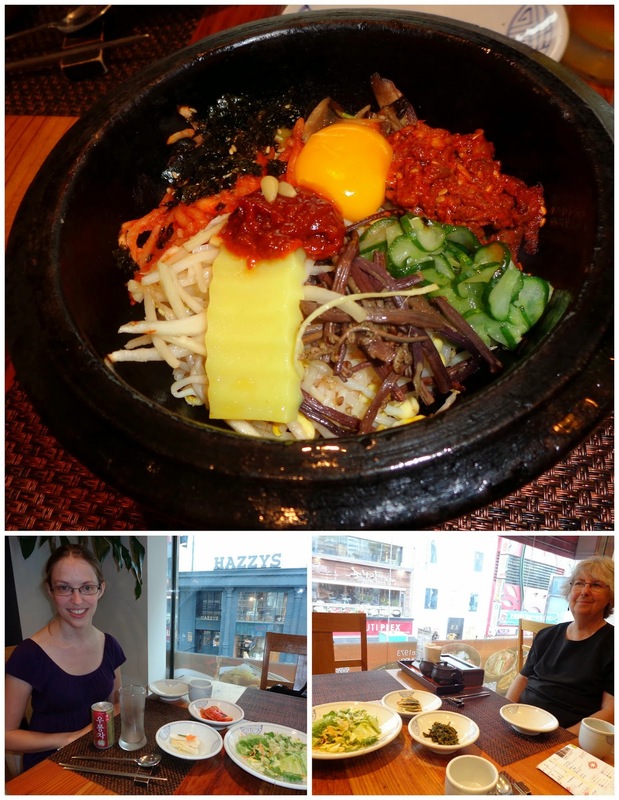 We went to a fancy bibimbap place in the area that we found because they had an ad on our tourist map of Myeongdong. After lunch we walked to the cat cafe and went up to the 6th floor. It was a smaller cafe, and they had no open tables at the moment. The lady took my cell phone number since it was a Korean number, and said she'd call when a spot opened up. We left and walked around until we were back at the big sitting area. We sat down and people watched, as I doubted whether or not we'd ever get a call. But sure enough, about 20-30 minutes after we'd left, I got a call saying there was a table. We were just minutes from the cafe, so we rushed around the corner and back up to the 6th floor. 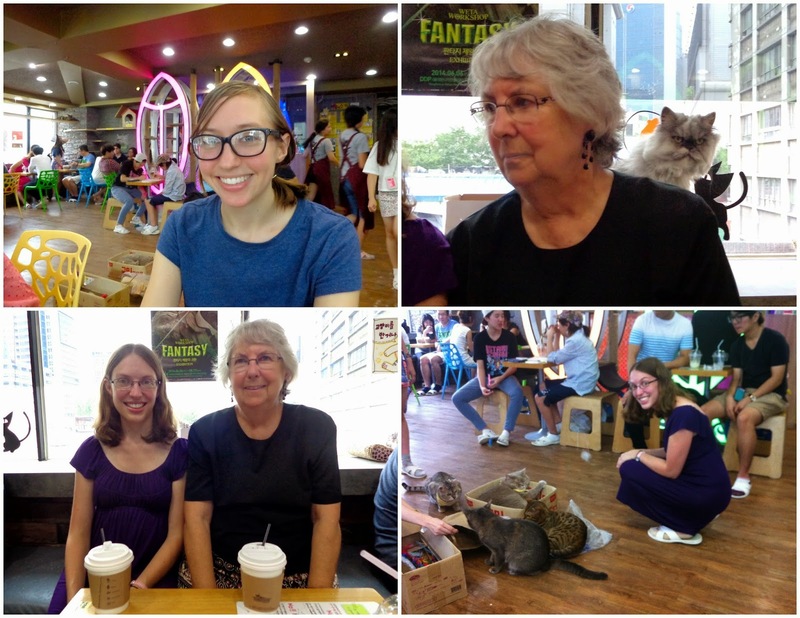 I've only ever been to one other cat cafe in Seoul, but in comparison this one was unfortunately not as great. I think every single cat except one was sleeping when we walked in. Lots of cats wore yellow ribbons around their necks, and we were told not to pet the yellow ribbon cats. At my other cat cafe experience, cats were milling about, walking across tables, and generally much more entertaining to watch. At some point during our cat cafe afternoon it started to rain. By the time we'd left and taken the metro back to our stop, it was raining much harder. Although we had two umbrellas (I was holding one over Grandma), I got completely soaked on the walk back to the hostel. Pants, shoes, shirt - all soaked. We picked up some soju, popcorn, and a few other snacks from the convenience store around the corner so that Jacki and Grandma could try the famous Korean alcohol that night (soju).